Sterling silver Claddagh charms are ready to slid or clip on to your chain or bracelet. Many of the sterling silver Claddagh charms that are available at The Irish Gift House are beads that are designed to fit all major competing charm bracelets; while others in the collection feature lobster claw catches so that you may quickly clip on to a necklace or link bracelet. All of the Claddagh charms in this assortment are made in Ireland and are hallmarked sterling silver by the Irish government. This clip on Claddagh charm is a double sided design that is crafted in sterling silver. Sterling silver Claddagh charm features inlaid Connemara marble in the heart. This sterling silver Claddagh charm is a clip on ring. Claddagh charm features sterling silver construction that is enhanced with Celtic knot-work. This sterling silver Claddagh charm features gold plated hearts. This sterling silver Claddagh charm bead features green crystal hearts. This sterling silver Claddagh charm with enamel accents is designed for a bead bracelet. This sterling silver Claddagh features an engraved bead along with a dangle charm with with enamel accenting. This sterling silver bead features a dangling Claddagh charm. The Irish Gift House also offers an assortment of gold Claddagh charms so you may wish to browse the collection for additional options. Most of these designs are crafted in 14K yellow gold. You may be wondering why our sterling silver Claddagh rings along with our gold Claddagh rings are not featured in under the Irish jewelry index heading. The reason is that we have so many designs and styles, including the Claddagh engagement rings and the Claddagh wedding bands, that we had to give them their own main heading so that we could balance out the product on our site. In fact, when you include the emerald Claddagh rings and the diamond Claddagh rings, we have a total of eight categories for you to peruse. 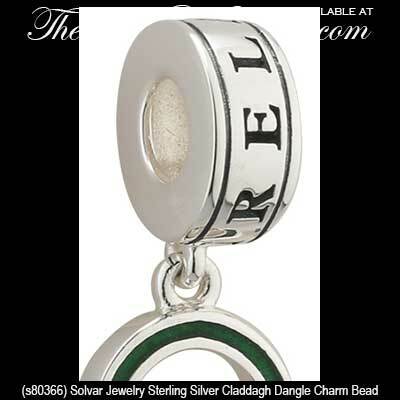 The sterling silver charms in this section are made by Solvar Jewelry in Dublin, Ireland.